A croft is a smallholding (a parcel of rural land under 10 acres) that is rented from a landowner. Crofting originated in the Highlands and Islands of Scotland after the Clearances. It allowed people to stay on their traditional lands even after the property was transferred to other owners. This ancient way of life is protected and defined under Scottish law, and does not pertain anywhere else, but we consider the definition to describe our own circumstances here in Canada. Many crofters reflect the experiences of homesteaders in North America, and share a demographic that mixes traditional farmers with university-educated counter-culturalists. Before the 1600s, most Highlanders in Scotland lived in close communion with their laird or chief. They farmed, hunted, cut peat, and wild-gathered. Both land tenants and their chiefs were Gaelic speaking, and often closely related. The system shifted in the 1700s so that the landowner or laird was English speaking, might live at a distance, and rarely interacted with his tenants. The Scottish uprising of 1745 and the subsequent English victory and occupation of Scotland made it all the more certain that the small farmer and land tenant would lose their semi-feudal way of life. Despite history and their landlords moving into a new paradigm, the subsistence farmer of the Highlands was still living much as his ancestors did three hundred years before. Sheep became more lucrative occupants of Highland fields than the traditional land tenants. Sheep farmers from the south were hired by landowners to manage the large flocks run on the hills. Local farmers couldn’t raise the capital to buy their own flocks. Wool prices at the end of the eighteenth century rose significantly. Beginning in the 1760s and picking up speed by 1785, tenant farmers were being relocated from their Highland cottages and way of life, moved to the coast where they took up fishing and kelping—collecting seaweed to be burned in pits to make potash for fertilizer, soap and glass. They were not sea-going people for the most part, and the allotments they were given on which to live—called crofts, designating a divided field, were not sufficient to feed a family. If the land was poor, they had to go kelping, the whole family lugging baskets of wet seaweed. If the land was rich, they paid more in rent, and once again the family went kelping to pay their expenses. After the 1820s, though, the bottom dropped out of the kelp market as the potash could be imported cheaper from deposits than it could be manufactured in the kelp pits. Then the potato crop failed for several years between 1840 and the mid 1850s, as it had in Ireland. With no right to their land, crofters began to emigrate, mainly to North America. Some landowners paid for their passages as it was cheaper than trying to keep them on their crofts. Although it took four years of petitioning, the Crofters Act of 1886 ended the clearances and gave crofters the right to remain on the land they farmed, with fixed rates of rent and right of claim on improvements they made. Crofters have control of a parcel of land, which can be as small as half a hectare, but is more likely closer to five hectares, although the largest parcels may be as much as 50 ha. (One hectare [ha] is 2.47 acres, or 100 m x 100 m.) Crofters share some sort of commons, fields or hillside pastures, where they keep their sheep or cattle. This way of life has seen a resurgence of interest after waning through the world wars and with out-migration to cities where jobs were more plentiful, the hours regular and the pay steady. Some young crofters have inherited or assumed their crofts from parents; others have bought in as tenancies have come up for sale. Some younger crofters returned with college degrees and professional credentials, looking to get back to a simpler life. Crofters have the right to pass the tenancy on to their children, along with their improvements. The most recent surveys show that there about 17,000 registered crofts in Scotland, with 13,000 crofters and a total population in the croft townships of 35,000. The number of crofts increased after the Crofting Act of 1886 was passed, culminating in 2,700 new crofts by 1950. Some crofters hold more than one croft. 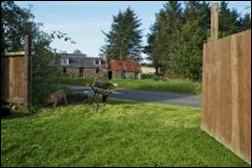 A croft is usually a cottage with a few outbuildings, with some acreage around the buildings and perhaps access to other fields as well as the commons. Generally, the land is poor, so intense agriculture isn’t possible. Some crofters are working with green houses and poly tunnels to extend their growing season and improve growing conditions. Others focus on raising animals indigenous to the Highlands, rare breeds who have survived in small numbers due to their thriftiness of growth and nutritional needs. They are hardy and small, for the most part, unlike the commercial breeds of cattle and sheep grown for mass market production. Some, such as the Shetland sheep, have become popular in other countries and are now seeing a new popularity on home soil. Croft life, though, is not for the weak. To actively participate in crofting programs, the croft needs to be worked at least at a subsistence level, supplying table food for the croft family. Some crofters raise meat animals such as pigs and lambs for market, but the return on the pound invested is usually quite low, especially as the heritage breeds do not produce a sizable dressed carcass. It is part of the growing movement of “Slow Food” and agricultural responsibility, with crofters attempting to make successful, at least on a small scale, the need to supply locally grown food even, or especially, in remote areas of the world. The crofts in the mountains and on the islands are exposed to extremes of weather, from heavy Atlantic gales to deep snowfall in the elevations. Farm work still has to go on; animals must be fed and milked no matter what the weather is like. Even if one wanted to keep indoors, the barn work calls. It can be dangerous; unexpected bad weather may send the crofter out into valleys and on mountainsides to fetch home stranded animals. Without the Crofting Acts, crofting would have disappeared, probably into the large estates held for sheep raising or into hunting preserves. This would have changed the ecology considerably, as the flocks on the large estates would never keep up with keeping the hills cropped of weeds and ferns, and the ecology of the highlands might have been changed considerably. Certainly, arable land, built up over centuries, would have been lost, and more food would have to be imported from Europe or even the New World to feed the cities and industrial towns. While Highland crofters certainly have an independent streak—for why else would anyone choose a life of hard work and little reward—they are not, in general, of the sort of self-reliant pioneer most American homesteaders seem to be. They are more focused on good agricultural practice, on maintaining an old way of life, of staying in touch with the land, and on providing locally grown produce and meat for their communities. 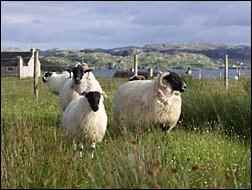 While isolated, they are within sight, in most circumstances, of other crofting cottages and even villages. Their cycle of daily life is very much keyed to the extremes of seasons in the north, with very long summer days and winter days that can be no more than twilight from dawn to dusk. Cottages and most outbuildings are small for easy heating and maintenance, and because the north of Scotland and the islands have almost no available timber. The sprawling log house and high gabled barn are unthinkable; our western standards for prosperous farming are particularly foreign to the crofting life. No one crofter is likely to have control of more than a few hectares of land, nor will they be likely to build a modern style American home on their croft. Hundreds of head of sheep or cattle could not thrive on their limited holdings or on the sparse mountainside forage of the commons. While crofters work together to further their cause and support their way of life through the Scottish Crofting Federation, they are not all in agreement on the future of crofting. Returning educated crofters looking to get away from the city aren’t always welcomed by their neighbors who have less education and must take laboring jobs off the croft. Some are seen as dilettantes , living on their crofts in the high summer, returning to city jobs in the bad weather, and perhaps using the croft as a summer home rather than joining the community wholeheartedly. There are the usual and universal problems over boundaries and roads, common to all rural areas. 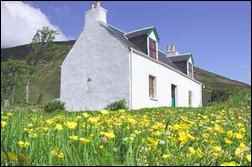 An issue of contention that has arisen in the last few years is whether crofters should be allowed to build holiday cottages to rent on their croft. These rented vacation homes allow non-crofters to experience rural life, bring more tourist moneys into a local community, and give the crofter an income independent of crops or off-land labor. Other crofters, though, see them as eating up arable land, of bringing unwanted and disruptive traffic into rural areas where farm animals may roam quite freely, and turning crofting into a tourist-dependent industry. It is, in small scale, the sort of issue that has disrupted Amish life in Lancaster County, or turned rural villages of New England into seasonal communities of wealthy city residents. Those who support having holiday cottages say that it makes it possible for them to earn a better living on the land, to promote the way of crofting to outsiders, and to use land that is no longer suitable for any other purpose. Part of the conflict may be that those with two or three rental cottages have more affluence; and it is not just envy that drives that conflict, but the concern that easy money will draw many crofters away from full scale farming. Tourism is a fickle business, at best, dependent on a strong economy and good exchange rates. In some ways, crofting is similar to homesteading, but it is not quite the same. Crofting has its own protective acts in Scotland, guaranteeing that the way of life can continue and preventing crofters from being displaced if landowners decide to use their land for something else. A few crofters buy their croft, if it comes on the market; most do not. Unlike renters elsewhere, they, not the owner, are responsible for the buildings and care of the property. 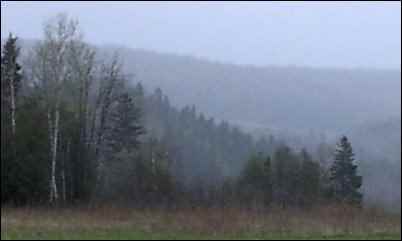 American homesteaders especially want large tracts of acreage; some western homesteads may be a hundred acres and more, mostly unutilized in any way except for timbering. Homesteaders always plan to be self-sufficient in meeting their needs, growing garden produce, hay, wheat, oats and corn; raising meat and dairy animals for themselves or to sell; cutting their own timber for buildings and firewood. Many homesteaders desire a location where they are out of sight of their neighbors, who may be miles away down a dirt road. And the concept of common grazing or common use land is largely forgotten in North America. New England and west to Ohio, some villages had commons for grazing, but this no longer exists. All land is owned in some way by individuals, corporations or the government, and grazing rights are hotly contended. Timber cutting rights are granted by contract or license; there is no sense of common use. In very few places are animals still turned out to range in North America. They are more likely held in fenced lots and pastures. And while in Britain the free ranging animal has right of way on a road, in most of North America it is the liability of the animal’s owner if it breaks loose and wanders into a roadway. This is a major change in point of view over the last three hundred years. In the early days of America, the British custom prevailed of letting animals forage. Houses, yards and garden were fenced in, not the animals. 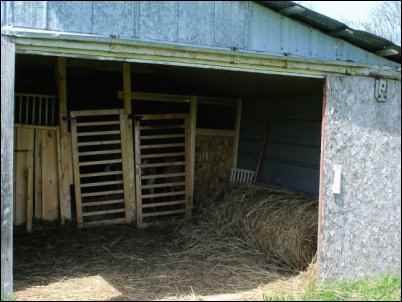 Homesteads in North America are reliant on either the tractor or the draft horse for power, while the crofter may use a much smaller tractor or even a pony in the daily farm work. Americans have access to fairly cheap hay and grain, and rich pasturage just about everywhere that cattle are kept, except parts of the west. Large herds, big animals, and less thrifty breed scan be kept and marketed. The crofter relies on the small, ancient, thrifty breeds of ancient lineage. The return per animal is smaller but the lower feed demands mean better economy. The main problem crofters seem to have is that feed costs plus butchering costs plus transportation costs are higher in Europe than in America, cutting into their profit margins even on the thriftier animals. The isolation of the crofts leads to problems with moving either live animals to an abattoir or prepared carcasses to market. Just as many homesteaders and small farmers here in America face stiff competition price-wise from supermarkets and discount merchandisers, so crofters, while producing a better quality product, face competition from mainland Europe and beyond. It is more convenient, and less expensive for the shopper to pick up a couple of pounds of pork chops in the shops than to buy through a co-op or directly from the crofter. As many American farmers and small scale producers have found, the quality makes no difference if the consumer cannot be made to care about it. When asked, most consumers will answer that they would prefer the organic fresher alternative, and want to support the small grower nearby, but when it comes down to Saturday morning at the Safeway, the sale package of pork gets tossed in the buggy. It is a tiny minority that will always buy from a local producer, through the farmer’s market, or will do without. While crofting will never be established in North America the way it is in Scotland, rural Americans and Canadians might consider some of the benefits of crofting. Instead of looking to buy large empty tracts without any housing or buildings on it, as is common in homesteading, those without those resources to purchase could consider buying or renting a small farm or rural parcel that may already have a dwelling and outbuilding. This is what we did; three and half acres, a hundred year old two bedroom house, and an old garage/workshop converted to a barn. We installed a new Amish-built, wood-burning heating and cooking stove in the house. The owners provided some of the funds for installation, and had the floor supported and leveled. Their plan is to use our rent money to make more improvements next year, while we will eventually take care of refinishing interior walls. We will also work to improve the land, with tillage and planting. So far, we have been able to support three goats on grazing just the lawn areas around the house all summer. I will buy hay and grain for the winter; our fields are in great need of reworking. Fencing will go up next year, and we plan to make that a work frolic for our churches. I have been talking to our landlady about putting in strawberries next year, which is a multi-year project. We will work together here and at her house to make that a possibility. This cooperation within the community and with other land owners is one of the positive forces American homesteaders could adopt from crofters. One of the reasons we used crofting as a model is that we are a middle-aged couple without children at home. My husband had a stroke two and a half years ago; his vision and stamina are limited. Three acres of land is about what we can manage, using some of it for pasture, some for hay and some of it in garden crops that don’t require a lot of intense work. Our plan is for strawberries, sweet corn and pumpkins to sell at market, and a variety of garden produce to can for ourselves. We keep a few chickens for eggs, and may expand our flock from a few gift-hens and three wee silkies to enough laying hens to sell a few dozen eggs a week, as well as raising the exotic silkies to sell as pets or broodies. The goats will provide milk for the household—Canadian law prevents selling raw milk, and processing equipment is expensive—and some kids to sell or raise for butchering. We will add a few Shetland sheep next year, once we have fences. I raised Shetlands for about ten years previously, and they are one of the breeds that crofters are trying to bring back. They are ideal for a small farm or rough pasture, diminutive in size like all Shetland farm animals, while being tough and versatile. There soft, long fiber fleece, ranging in color from white to black, with shades of brown and grey mixed in, is coveted by hand-spinners and specialty woolen mills. While the American homesteading dream is often imagined as vast sweeping vistas edged with forest, somewhere in Big Sky country, a smallholding in a rural area with like-minded neighbors may be more feasible and less strenuous. While the independent American spirit has a lot going for it and is much admired in our national history, the interdependence of crofting may provide a better way of life for many, and possibly a better supply of natural, locally grown food to the market.